We’d love your help. Let us know what’s wrong with this preview of A Pocket Guide to the Craft of Words, Part 2 - Microcopy by Christopher Murphy. Almost every interaction you make, through a website or application, involves words. Words can help, words can hinder. They can ease a user on their journey or they can get in the way, causing frustration. Given their power, it’s no surprise to discover that companies like 37signals and MailChimp, to name but two, position words at the heart of their design process. In this Almost every interaction you make, through a website or application, involves words. Words can help, words can hinder. They can ease a user on their journey or they can get in the way, causing frustration. Given their power, it’s no surprise to discover that companies like 37signals and MailChimp, to name but two, position words at the heart of their design process. 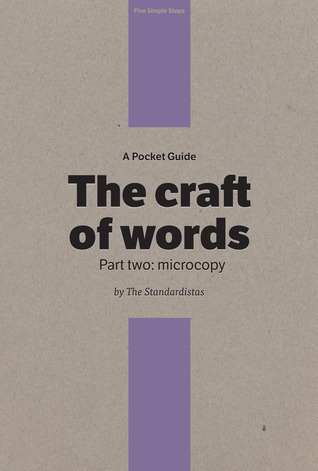 In this, the second part of The Craft of Words, The Standardistas explore the craft of words at a micro level, considering how microcopy can satisfy functional requirements by aiding and improving design interactions, enhancing interfaces for both function and delight, and helping users get things done. If you're a designer working at the coalface, helping to create and shape interfaces, this book is for you. The principles we cover will help you craft better, more effective interfaces that help your users get the task at hand completed, improving conversions and generally making the world a better place. Use the right words and we can ease a user along on their journey (we can even delight and entertain them). Use the wrong words, however, and we can stop a user dead in their tracks. Words are an often overlooked part of the design vocabulary, choose them wisely and your users will thank you. Carefully crafted microcopy ensures our web sites or applications work better, improves conversion rates and enables users to fulfil tasks. In this section we show how microcopy can, and should, ease the user’s flow, helping them get things done. PART 3: WHEN THINGS GO WRONG! Sadly things go wrong from time to time. When they do, carefully considered language – language which puts people first – is more important than ever. In this section we explore how language can be used to empathise with users, offering them a sense that we care about them and the predicaments they’re facing. Once we get the functional basics down, we can start to focus on delighting our users. In this section we explore ‘delighters’, those small but important fragments of copy that add a little pleasure to your user’s day and bring a smile to their faces. To ask other readers questions about A Pocket Guide to the Craft of Words, Part 2 - Microcopy, please sign up. A very basic overview of using clear, consistent, and appropriate words in microcopy for forms, errors, and other elements of interface design. There is a lot of great information about writing microcopy online, for further analysis of this craft. Goes together with A Pocket Guide to the Craft of Words, Part 1 - Macrocopy. This quick little read is packed with information about using words to delight users across a website or other design project. Quick, easy, and informative read. I wish it were more than a pocket guide, and I wish the quotes, etc, were better cited. A good little piece of reading that will freshen up your respect for microcopy with some finely selected examples. One sitting read that manages to get the point across and repeat it multiple times. Nice book, but maybe too superficial. Worth reading, but does not keep up with the expectations raised by the previous one. It scratches the surface of microcopy, and leave not much follow-up after you finish it. A short look at writing good microcopy: where to use it, when, and why. A quick read that will help you focus on an often overlooked, but important aspect of design. Short and sweet and useful. Best when paired with Part One. A good high level overview of how the use of words in interfaces can make or break a good user experience.